Happy first Friday of Lent, everyone! Mike and I have been plotting our fish fry outings, one of our very favorite things to do each year, and I've been examining the ways in which I've already failed at my Lenten resolutions, *sighs*. Let's take a look at my week, shall we? -1- Prayer. If only I could remember to say some. I am starting off this Lent feeling a bit spiritually dry. Like anybody else, I have spiritual peaks and valleys. Going into Lent, my prayer life felt uninspired and wilty (I just made this word up ;-)). But hope springs eternal, and I set up my Lenten resolutions to act as a springboard to help me feel spiritually stronger. I LOVE Morning and Evening prayer with Magnificat, as well as the other meditations and saint stories therein. So far, Morning Prayer has been a breeze and a blessing. On the other hand, I have forgotten Evening Prayer every.single.evening. I haven't remembered *once*. My mind...I just miss it SO MUCH. I need to develop a new habit. In the past, I had a habit of bringing my Magnificat up to bed with me along with the book I was planning to read. I created a little stack to take upstairs with me, pulling the Magnificat out of my purse after I got home from work. Up in bed, I'd read Evening Prayer, and then move on to my book. I remembered every night. I'm going to aim for that again. -2- The tiniest of our Lenten resolutions: "Uh oh Mommy, I am going to go pee on the rug!" And so she speeds off to the bathroom, wiggles up onto the toilet all by herself, and thinks that this is great fun. Go to town, I say. The prize is getting to flush when she's finished. It's far from perfected, but we're getting there. Speaking of dance, some fun tidbits. Tomorrow, I'm going to see one of my troupemates perform. She will be graduating with a BFA in dance this May, and she is performing her senior project on Saturday. It is the first time in the history of her college that a student has been permitted to present Egyptian dance for this senior project. I'm driving down there with another dance friend, and we're all going out to dinner afterward, should be a lot of fun. I love watching dance in all forms, especially solos. Each and every person brings their own flare and style to it, and it's just a beautiful thing to see. -7- "Oh. This costume bin is getting a bit *full*..."
I would love, love, love an orange dance costume. Let's see if this dream can become a reality, shall we? And so that's my week! How was yours?! Leave me a comment! 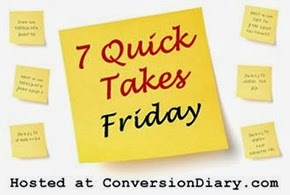 And check out more 7 Quick Takes over at Conversion Diary! Oh! A question I can answer. *adjusts SAHM hat* A St. Joseph altar. It can be simple or elaborate as you want. I know you hate baking but you don't have to. http://www.thankevann.com/stjoseph/ Has awesome ideas and images you can use to create one. That's what we're making during "school" time. Oh thank you! Sometimes called a "St. Joseph's Table" right? Confession: I am reading this (and other) blogs at work. One of the things I was NOT going to do during Lent. Ha ha! Thank you for sharing and commiserating. :) We're all in this together! That purse looks awesome! Where is it from? St. Joseph's day is a huge deal for the Italian community in New Orleans. People decorate altars to him with all kinds of special baked goods, especially anise cookies.